If you look back into history, really back into history, you will find interesting styles – hairstyles, dressing styles and concepts. What is even more interesting is to see why people dressed the way they did. There were rules, hierarchies, obnoxious beliefs and interesting stories. History is a very interesting topic. It is so fascinating to know how people lived in olden times. And just think of it, there was a time when there were kings-queens, not a world of normal, working adults. How did the queens live? They wore elaborate dresses and actually had helpers help them sit and stand because their dresses were so heavy. What did the Kings do whole day? Address courts and fight on horses? How did man survive when he did not have a safe place to live and had to wander through forests having experimental food and fighting for life every day? How did he really invent shoes? For me, all of it is really fascinating. And magical, to some extent. 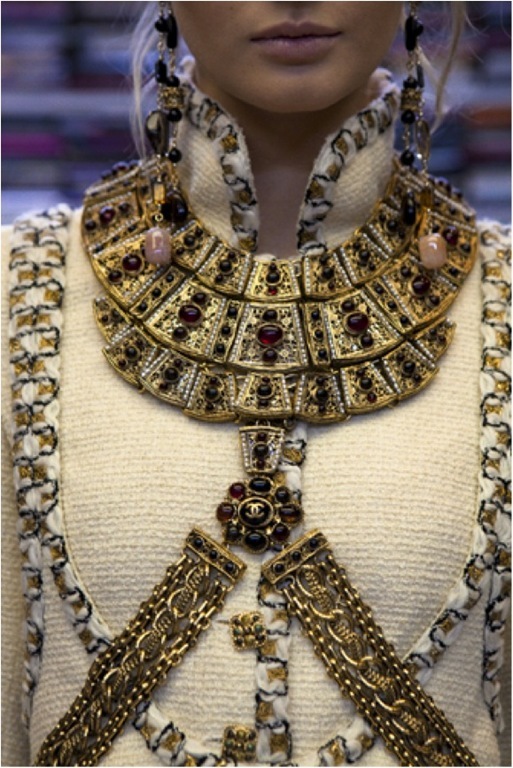 We can trace back clothing and accessories way back to 3100 BC to Ancient Egyptian and Mesopotamian civilizations. 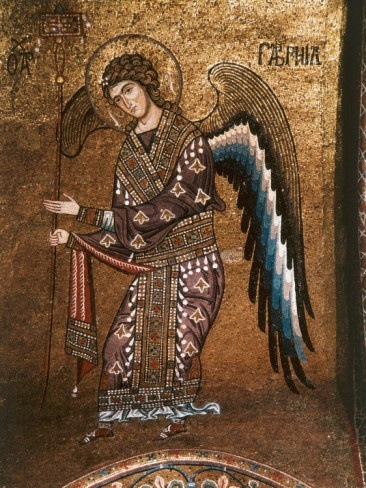 Ancient Greek, Rome, Early and Late Middle Ages, Northern Renaissance – all of these eras are superbly charming. 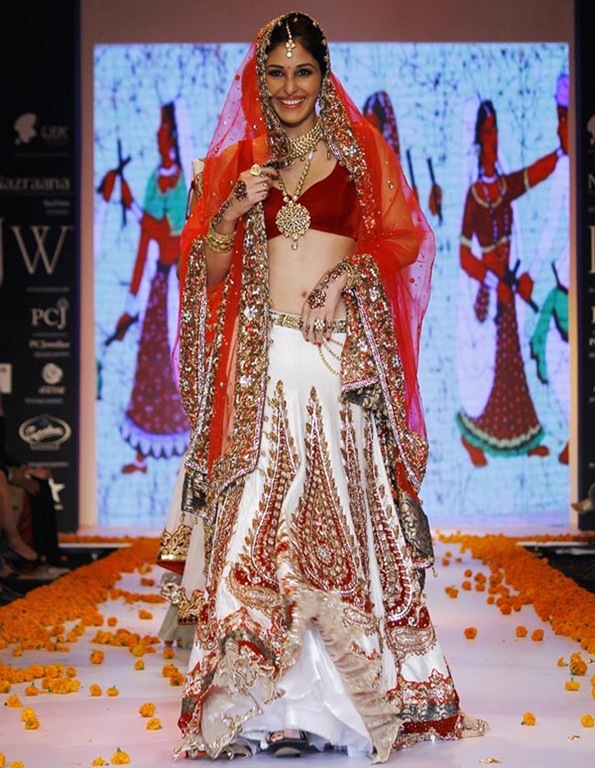 Clothing gets richer, more elaborate and ornate. But guess what, history repeats. And how! 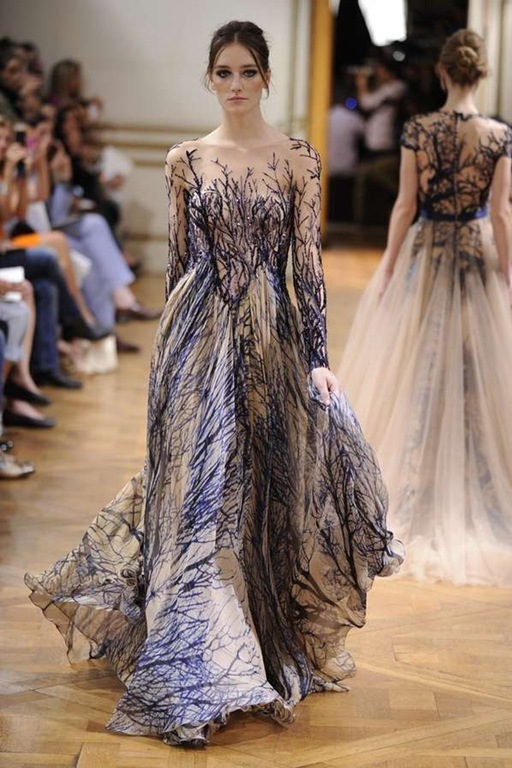 Designers have taken inspiration regularly from olden time’s art and costumes. Some influences are blatant, while some are subtle. I like both of them. For my first assignment in the History of Fashion class, I was allotted Medieval Ages (300 – 1500 BC); so the costumes are not ornate. Just interesting. Here are the old pictures and their modern day influences. Wimple: A garment worn around the neck and chin, and which usually covers the head. 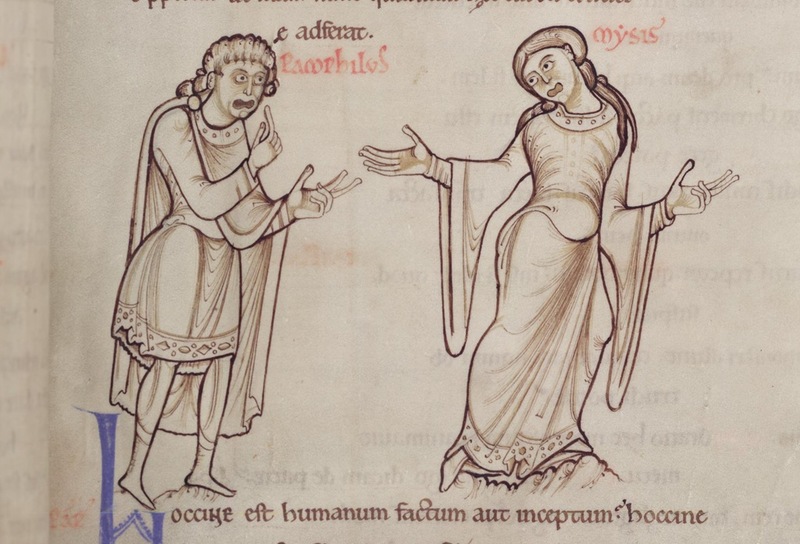 Bliaut: a women’s and also a men’s overgarment worn from the eleventh to the thirteenth century in Western Europe, featuring voluminous skirts and horizontal puckering or pleating across a snugly fitted under bust abdomen. The sleeves fit closely from the shoulder to approximately the elbow, and then widen from the elbow to drape to floor- or nearly floor-length. 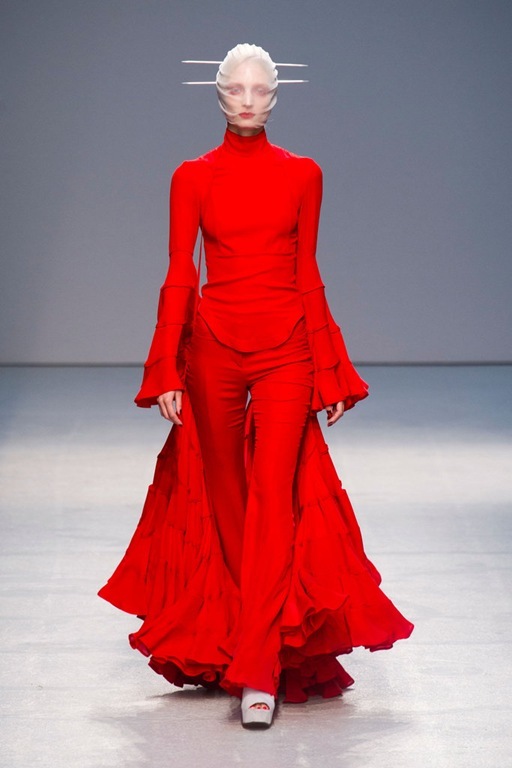 Gareth Pugh Sprint 2013. May not be a perfect adaptation of the original concept but I just loved the ruffles and fall on this outfit! 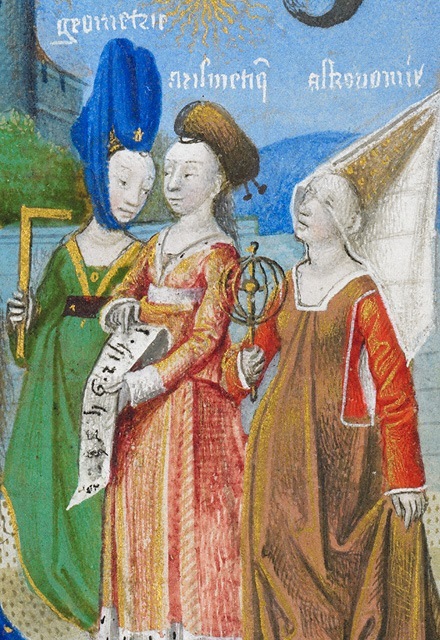 Hennin: A headdress in the shape of a cone or “steeple”, or truncated cone worn in the late Middle Ages by European women of the nobility. 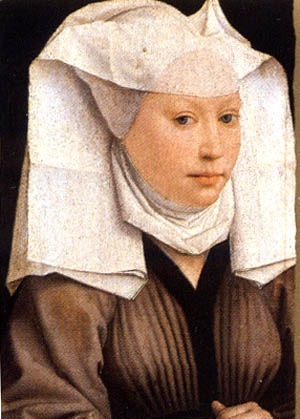 Houppelande: An outer garment, with a long, full body and flaring sleeves, that was worn by both men and women in Europe in the late Middle Ages. Segmentae: Square or round decorative medallions that were placed in different areas of the tunic for decoration. Clavi: Vertical stripes which decorate the front and back of a tunic. And I can just go on and on. There are so many beautiful costumes and their modern day designs that it is really inspiring. Check out pictures of Dolce & Gabbana Fall 2013 collection on this lovely blog. Their collection, also inspired by medieval times, is mesmerizing. All their models look like Princesses. If History, Art and Fashion interest you, check out Byzantine, Italian Renaissance, Medieval Times, Ancient Greek and Roman Empires costumes. You will be surprised with what you find. 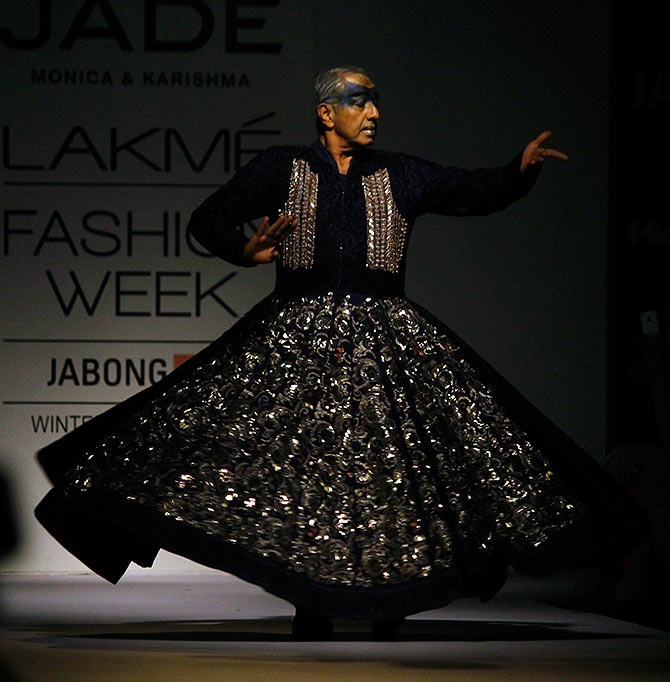 This entry was posted in Fashion, Runway Fashion, World of Designing and tagged anuj sharma, astad deboo, bliaut, button masala, byzantine empire, chanel pre fall 2011, clavi, costumes, dolce gabbana, fashion show, gareth pugh, hennin, history of fashion, houppelande, jade monica, mario testino, medieval time, middle ages, vogue UK, wimple on October 1, 2014 by NS. I recently posted an interesting video on my Facebook page. It was Rick Owen’s Spring 2014 collection fashion show from Sept 2013. Interestingly, his models weren’t slim, tall and fair. They were black and had real bodies. They did not do the regular catwalk. They were not required to look pretty. They had their faces angry and gritty. They bared their teeth and looked ferocious while they performed the step-dance. Their energy was violent. It is indeed a captivating video. Stepping is an old form of dance that originated in Africa. It is an aggressive dance in which the dancer’s entire body is used to create rhythms through footsteps and hand clapping. This dance is usually performed in groups. African tribal men used this dance to attract and impress women. Their step-dance involved rolling their eyes and baring their teeth. More aggressiveness was considered more attractive. Step-dance was very popular in American Universities amongst African-American students. Today, there are stepping dance groups and competitions. The point of all this is that fashion picks up lot of things from history. History repeats itself. 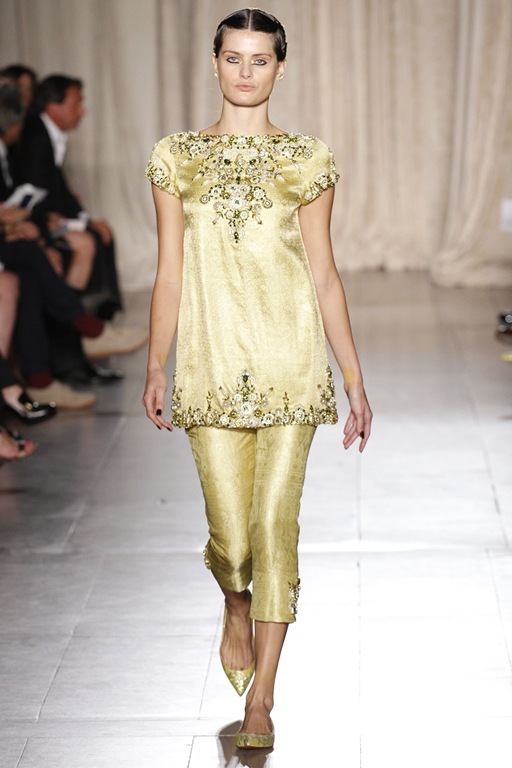 We see how trends of sixties and seventies keep coming back; how vintage is totally in suddenly. 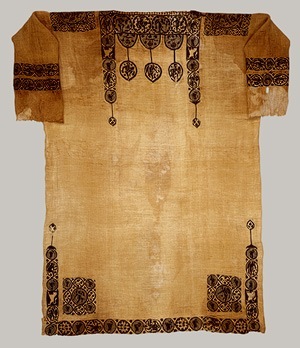 If you go back and look at how people dressed in 3000 BC in various dynasties, you will see familiar designs. Many of today’s styles have been picked up from there. Rick Owen’s Spring 2014 sportswear collection is called ‘Vicious’. His way of presenting his collection through vicious step-dance has been very innovative and made everyone sit up and watch. You MUST watch the video. It is spectacular. We were shown this video in our History of Fashion class. This entry was posted in Fashion, Runway Fashion, World of Designing and tagged fashion show, history of fashion, inspiration, rick owens spring 2014, runway fashion, step dance, stepping, vicious rick owens on September 10, 2014 by NS. 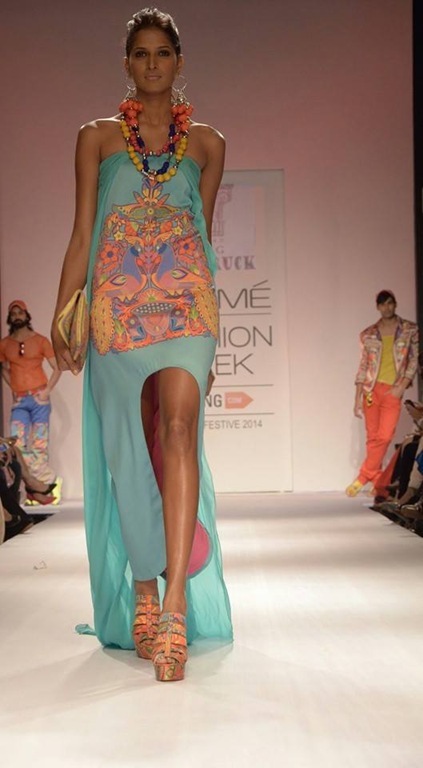 Top Pakistani designers dazzled on Day 1 of Lakme Fashion Week 2014. They brought in colors, patterns and art of a different culture, this bringing in a whiff of fresh air to this popular runway show. These designers debuted at the fashion week for the first time and oh, what a grand introduction it has been. 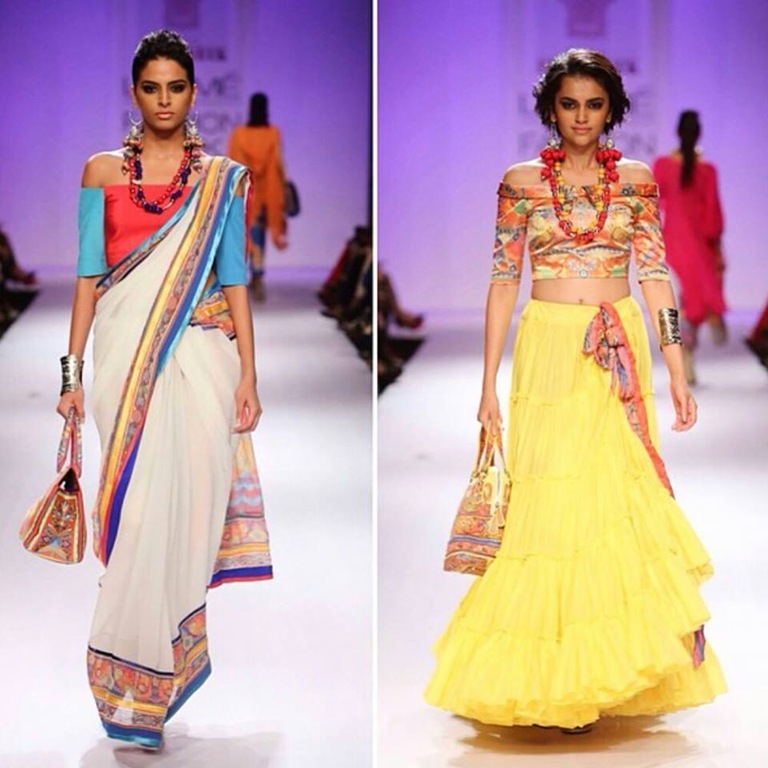 I loved Anita Dongre (always a favorite), Anavila, Swati Vijaivargie and Shruti Sancheti (tough to choose just four favourites) too but designers from our neighbouring country brought something new on the plate. Here are some of my favourite looks. 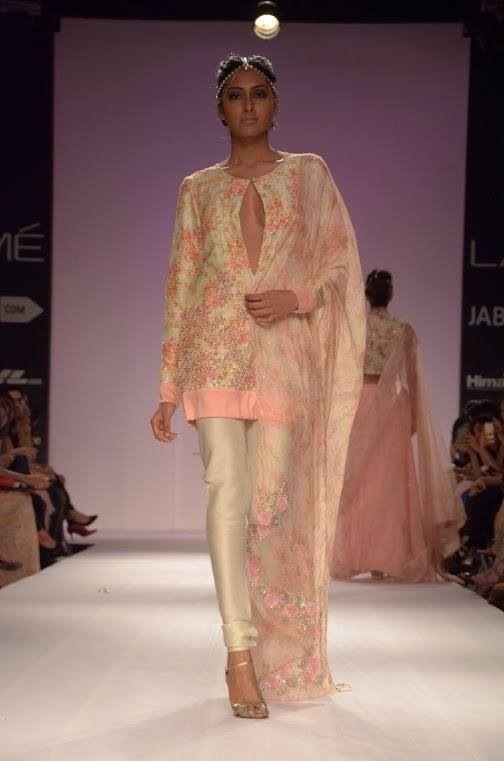 Sania Maskatiya’s collection ‘Sakura’ was inspired by Japanese culture depicting cherry blossoms, tea houses and famous Japanese landscapes. Her silhouettes were classic, yet contemporary, very wearable and prints, refreshing. 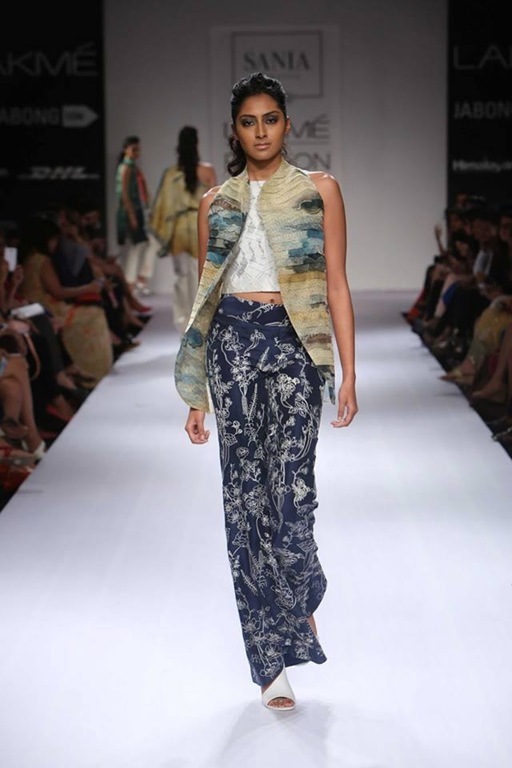 I loved the silky fabric she used and how she mixed fauna prints with geometric. 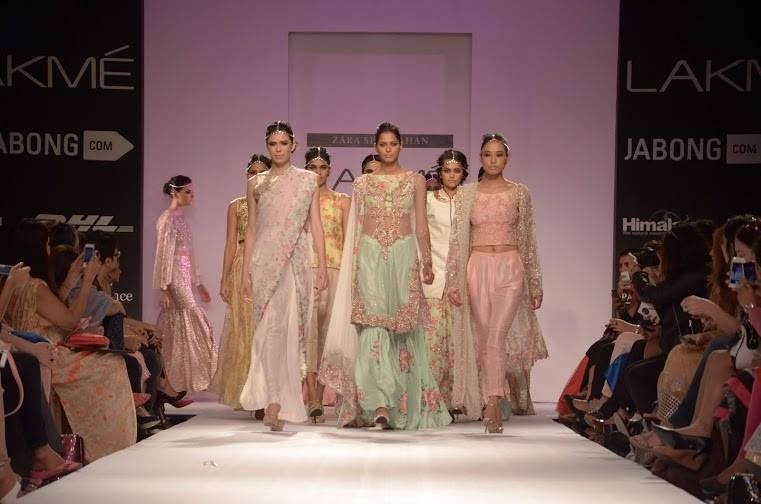 Her collection, ‘City of Gardens’, was inspired by vintage fashion of old Lahore; vintage florals were pre-dominant. 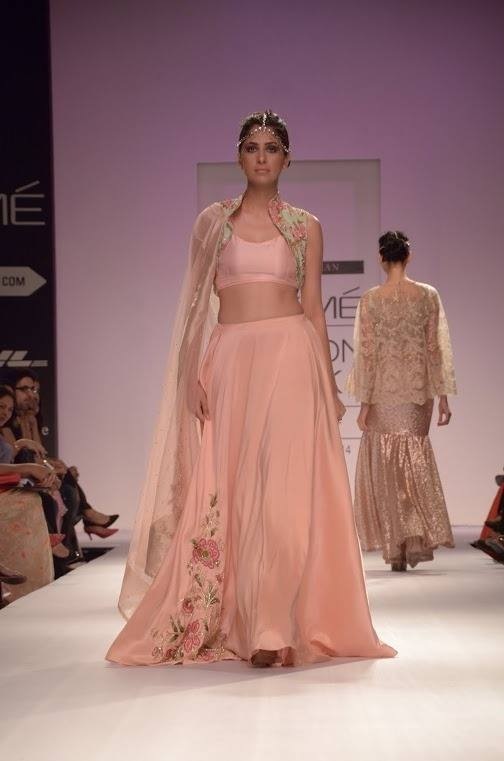 She used lot of organza and shimmer in pastel colors. 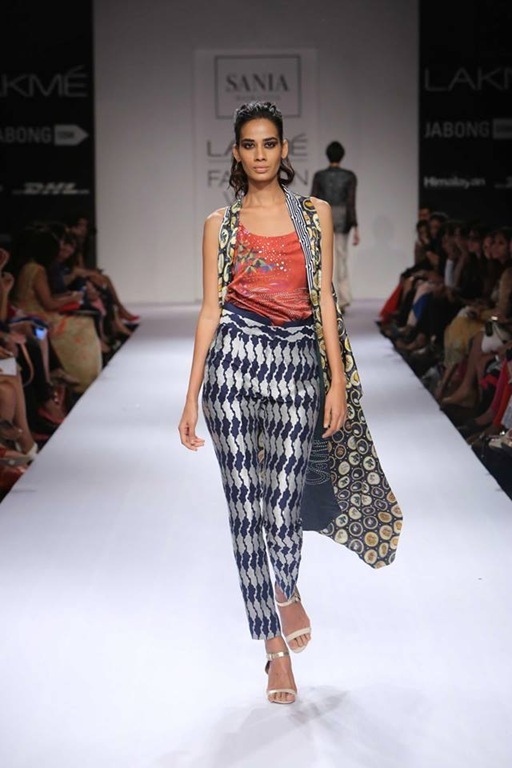 She is known for her intricate designs and silhouettes that represent feminine grace. Probably my favourite of the lot. His designs for the fashion week were taken from truck art. 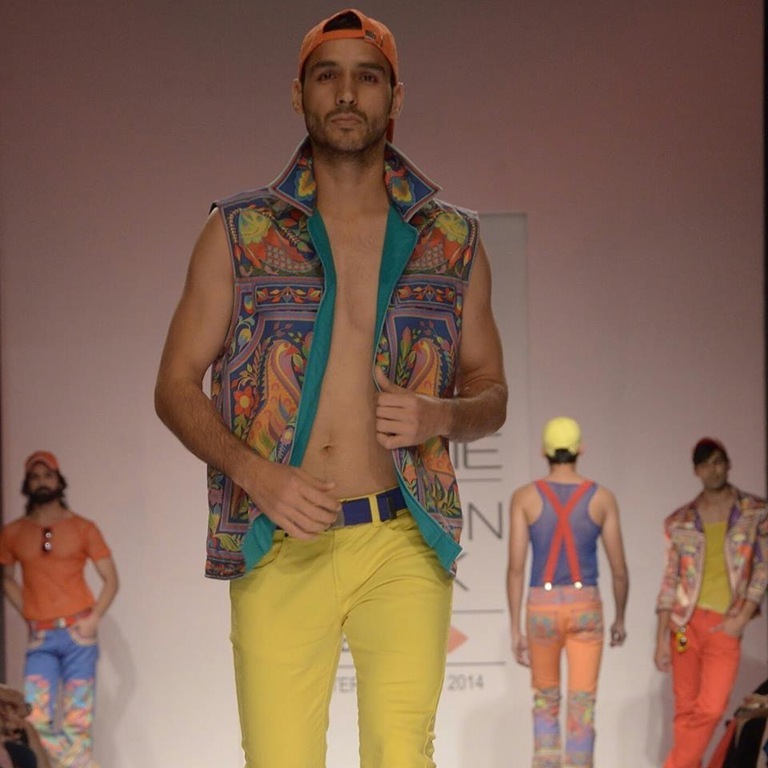 He dedicated this collection to local artisans of Pakistan ‘who work on streets and are not recognized’. His quirky graphical designs were dosed in overwhelming color combinations. This entry was posted in Fashion, Indian Fashion Scene, Runway Fashion and tagged bay area blog, cross cultural, fashion show, indian fashion, indian fashion blogger, lakme fashion week 2014, lfw, lfw2014, pakistani designers, rizwan beyg, runway fashion, san jose blog, sania maskatiya, zara shahjahan on August 26, 2014 by NS. In our Principles of Design class, we are given a theme for our final projects based on which we are required to make a miniature dress. Past topics have been vegetation and sea world. This time, we are asked to make costumes based on microorganisms. Can you believe it??!! I feel terrible about it. I am someone who cannot look at any vaguely gross sight like blood, cut, animal close ups and I am expected to go through hundreds of microorganism pictures on internet, study them and choose one. Well, I tried thrice today and ended up getting goose bumps, shuddering horribly and closing the page with trembling hands. Jeez, I am still shuddering. I have been really looking forward to this project but this is scaring the wits out of me. I am thinking of asking a friend or someone to go through pictures and save some decent pictures for me to look at – pictures that do not resemble a living being or their parts in anyway. That apart, I found some really cool pictures of designs inspired by nature, mostly plant and animal life. Our instructor showed us books of excellent designs created by geographical structures like deserts, oceans, raindrops, etc. This is a great tip for aspiring designers. Look around at nature. You will find symmetry and design there. Get inspired by them. And I will let you know after a few days what I did with my project. 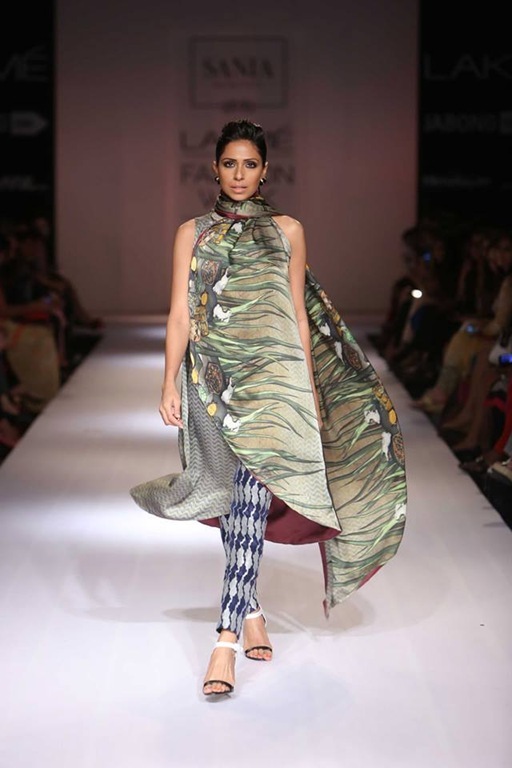 This entry was posted in Fashion, Runway Fashion, World of Designing and tagged california fashion blog, india fashion blog, mother nature inspired designs clothing, san jose fashion blog on November 25, 2013 by NS.